Report on the 20th annual wine tasting presented by Hospice du Rhône (HdR), on Friday April 27th and Saturday April 28th, 2012, at the Paso Robles Event Center in Paso Robles, California. The event is the largest celebration and tasting of Rhône-varietal wines in the world. The 2012 edition of HdR was announced as sold out – a great tribute to its 20th year. The festivities began on the evening prior to the main event with two highly-anticipated and limited-attendance events focusing on the wines of Châteauneuf-du-Pape. Starting early on Friday, HdR weekend attendees experienced two non-stop days of morning seminars, lunches, a live auction, two big afternoon tastings, and concluding with a farewell barbeque on Saturday evening. Add to all that the gatherings for wine dinners at local restaurants and late-night libations at the Villa Creek bar in downtown Paso Robles, and you can see why sleep is almost an afterthought at HdR! Hospice du Rhône is a non-profit organization whose purpose is to “improve the business conditions of the grape growers and wine producers of Rhône variety wines and grapes throughout the world.” The group helps to promote Rhône-varietal wines, with a motto of “Twenty-two Varieties, One Vision.” Founded by Mat Garretson as The Viognier Guild, the first gathering of the group was in Georgia (where Mat lived at that time) in 1993. Vintner John Alban, who attended that inaugural event, became Mat’s partner in the organization, and it soon moved to California and changed its name to reflect a broader vision than strictly Viognier. Mat and John worked hard to attract Rhône varietal producers from around the world, and the seminars and tastings have been recognized as among the best at any wine event. Combined with the sense of fun that pervades the weekend, it has become many winelovers’ favorite annual gathering. Mat stepped down from leading HdR a few years ago, but John continues to lead it along with Director Vicki Carroll. Some major changes to HdR were announced shortly after the 2012 event in Paso Robles – more on that at the end of this report. Over the years, Hospice du Rhône has offered an exceptional opportunity to taste wines from top Rhône-style producers in the United States plus many wineries from France, Australia, and around the world. We tasted wines during seminar presentations, at lunches, and at two big afternoon tastings. Over the course of the event, it didn’t seem like the wine would ever stop – and that was fine with me! There were some changes in the Hospice du Rhône schedule in 2012, notably the absence of the Thursday evening “Rhône-n-Bowl” bowling tournament. But taking that time slot in the proceedings were a pair of limited-attendance events that sold out very quickly. The first was a seminar at the Paso Robles Inn featuring a rare opportunity to taste Châteauneuf-du-Pape wines dating back to the 1950s. Harry Karis (author of “The Châteauneuf-du-Pape Book”), famed winemaking consultant Philippe Cambie, and sommelier Kelly McAuliffe hosted this event. Following the seminar was a dinner at Bistro Laurent, where vintners from Châteauneuf-du-Pape joined Karis and McAuliffe for a meal built around wines from the region. I was not able to attend these two events, though I did make it to a very pleasant reception for trade and media guests late Thursday afternoon at the Paso Robles Inn. It was a nice way to meet people in a small, low-key setting, and the reception featured a number of intriguing Aussie sparkling Shirazes poured by Chuck Hayward of J.J. Buckley. Following the traditional late night at the Villa Creek bar, I began Friday morning with the first pair of seminars. The seminars at this 20th HdR featured people who have had a long history with the event. Starting things out was “Why Spain (still) Rocks!” – a look at new developments in Priorat, Jumilla, and other Spanish wine regions. Moderator Steve Olson led noted importer Eric Solomon of European Cellars | Eric Solomon Selection and four of his producers in a spirited discussion and tasting. Next up was “The Return of the Bionic Frog,” with John Alban presenting Christophe Barone of Cayuse Vineyards in Walla Walla. It’s always tough to get up early for the morning seminars, but Saturday began in a fine way with “A Collective Quest: A History of Les Vins de Vienne.” The Rhône Report’s Jeb Dunnuck moderated, as Yves Cuilleron, Pierre Gaillard, and François Villard presented wines from their joint project. Wrapping up the 2012 seminars was “d’Arenberg: Research, Revelations, and the Art of Being Different,” where John Alban joined Chester Osborne of McLaren Vale’s d’Arenberg as he led us on a tasting through no less than 13 of his wines. Although there were some good seminars the previous year, I found the 2012 seminars to be a step up. We were able to sample Spanish wines that encompassed a range of grape varieties and winemaking styles. And I enjoyed tasting a nice cross-section of wines from Les Vins de Vienne, which enabled me to contrast them to those made by the three individual vintners whose wines I tried at the afternoon tastings. Both Christophe Barone and Chester Osborne were highly entertaining at their seminars as we learned much about their vineyards and wines. And to top it off, each of the seminar attendees got to take home a plastic frog and a boomerang from these two sessions! As always, the team of HdR sommeliers did a tremendous job of pouring all of the seminar wines, and the Riedel stemware helped to bring out the best in them. I heard a number of people say that the food at the event in 2012 was the best yet, and I might just have to agree – it was truly one of the highlights of the 20th HdR. Trumpet Vine Catering of Paso Robles served up the tasty Friday and Saturday pre-seminar breakfasts, and it was no surprise that the Green Star Coffee station attracted a large crowd. The traditional Friday Rosé Lunch was exceptional, with Chef John Toulze of Sonoma’s the girl & the fig treating us to a menu that included duck confit and warm Provençal potato salad among other fine dishes. The Saturday lunch was delicious too, with Chef Rick Manson of the Far Western Tavern in Guadalupe presenting a meal that included arugula and baby back rib salad and oyster mushroom, ricotta, and talegio raviolis. Wines for both lunches were provided by a number of HdR wineries – as always, the Syndicat Tavel Wines were a hit at the Friday lunch. Food at the two afternoon tastings was outstanding, most notably that from Blackberry Farm in Walland, Tennessee – their fried chicken and deep-fried bacon (yum!) had everyone talking on Friday afternoon. They were joined by nearly a dozen other fine food and beverage purveyors at the Saturday tasting. Last but not least was the Farewell BBQ dinner on Saturday evening, where Chef Maegen Loring of San Luis Obispo’s The Neon Carrot served us a memorable Latin-American themed meal, appropriately accompanied by wines from Wines of Chile and beer from Firestone Walker Brewing Company. Friday lunch serves as the time when the annual HdR Person of the Year is announced, and in 2012 the honor went to Sondra Bernstein and John Toulze of the girl & the fig in Sonoma. They’ve not only served many fantastic meals at the event for years, but they’ve traveled to both the annual HdR at Blackberry Farm event in Walland, Tennessee and the bi-annual Decouvertes en Vallée du Rhône in France. It’s hard to think of HdR without the food of the girl & the fig, and the combo of Sondra and John was a fine selection for HdR Person of the Year. Besides the fine food and wine, the Saturday lunch serves as a lead-in to the Live Auction. Always entertaining, the auction – conducted by auctioneer Todd Ventura and his skilled team – featured 29 separate lots in 2012. The lots featured not only wine, but also dining, tours, and more. Magnums and other large-format bottles are always popular auction items, and one of the lots was a 27-liter bottle! The top auction bid went for the “Hospice du Rhône at Blackberry Farm 2013” lot, which included accommodations and meals at the noted hotel and resort in the Great Smoky Mountains for HdR’s fourth annual event there, plus a special dinner with an exceptional list of wines to pair with each course. We concluded HdR with the Saturday Farewell BBQ at the Fairgrounds. Along with our delicious dinner, we enjoyed the spirited country and rockabilly music of Monte Mills and the Lucky Horseshoe Band, who had plenty of people dancing as late afternoon turned to evening. It’s become a tradition for attendees to open some exceptional bottles of their own wines to go along with the food and company. Our table boasted older bottles of Château de Beaucastel, Alban Syrah, and Sine Qua Non Syrah – not too shabby! As I’ve written before, the BBQ is a fun time but somewhat bittersweet in that it means saying goodbye to many friends whom I only see once a year at HdR. It seemed to me that the attendance at both of the afternoon tastings was up from the past few years, and sure enough, it turned out that 800 tickets had been snapped up by eager Rhône fans for the Friday tasting and 1,200 for Saturday – sold out both days. Perhaps this being the 20th annual HdR brought out a bigger crowd despite the continued economic slump, and it was good to see more people at both the seminars and the afternoon tastings. The Friday afternoon tasting had a slight change in format from previous years, becoming the “BIG” Rhône Rendezvous and featuring many producers pouring from large-format bottles – magnums, three-liter, five-liter, you name it. With the larger bottles came more library wines at the Friday tasting, more than I’ve seen in several years. 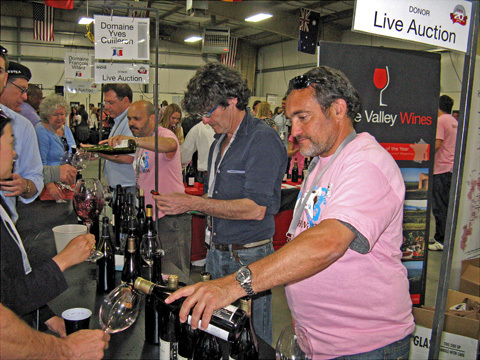 The Saturday Grand Tasting is always larger than the Friday one, with more producers pouring and more people attending. Even so, the table layout allowed plenty of space to circulate, and few tables were so crowded that I was not able to squeeze in pretty easily for a taste. Some wineries poured on both Friday and Saturday while others were there on only one of the two afternoons. It may seem like a small thing to many people, but I have to comment again on the HdR Event Guide that all attendees receive. It has set the standard as the most thorough and helpful tasting guidebook I’ve seen at any large wine event. I’ve found it essential for developing a strategy to approach the two afternoon tastings – who’s pouring on which day, what wines they’re pouring, etc. It has also been a nice souvenir to take home – I still have the Event Guides for every HdR I’ve attended, all the way back to 2000. And for the third year, HdR supplemented the printed Event Guide with their free “iRhône” app for mobile devices. From the HdR Event Guide, I counted over 270 separate producers represented at over 150 winery and importer tables at the tastings, up a bit from the previous year. In all, there were over 900 wines available to taste. As always, there were a large number of California wineries pouring at the tastings, with most hailing from the Central Coast but with many from other parts of the state as well. Joining them were producers from Arizona, Oregon, and Washington and from six other countries – Australia, Chile, France, Italy, South Africa, and Spain. There were over 100 French producers represented in 2012 (also up a bit from last year), giving us a great opportunity to sample wines that many of us don’t often have a chance to taste. Every year, HdR presents a tremendous line-up of producers. It’s never possible to taste at all of the winery tables I’d like to, given the limited time. I missed quite a few that have been favorites in past years, as I was trying to taste wines from a few more producers that were new to me and also taking advantage of the opportunity to taste the wines of so many French producers. I passed on a number of wineries whose wines I’d tasted at recent tasting events, including Andrew Murray, Anglim, Beckmen, Derby, Halter Ranch, Jemrose, Martian Ranch, Qupé (though I did taste their library wines), Sanglier, Skinner, Skylark, Terre Rouge, and Wrath. And I skipped others where I had tasted at recent winery visits, including Foxen and Tablas Creek, as well as at Linne Calodo (where I visited the day before HdR started). Grape-Nutz colleagues Eric Anderson and Al Osterheld added to the notes presented in this report – they’re designated with an “(EA)” or “(AO)” at the end of the note. One of the great things about the Friday BIG Rhône Rendezvous and Saturday Grand Tasting at HdR is that they are large enough that one could focus their entire time on a particular wine region, grape variety, or wine style, yet they are also diverse enough to sample a tremendous variety of wines. I tried to do the latter, and was not disappointed. Most current release whites and Rosés being poured were from the 2010 and 2011 vintages, while 2009 seemed to take up the largest proportion of reds, with some 2008s and brand new 2010s on display as well. Of producers I tried that were new to me, I felt that Kale was a standout, with two very good 2009 bottlings. As usual, there were some fine library wines, and as noted above, many wineries generously opened large-format bottles of their older releases. There were a few barrel samples being poured as well – of the ones I tasted, I thought the Halcón 2011 “Esquito” GSM blend was particularly nice. As expected, the tastings featured many excellent wines, and in general I thought red wines the 2009 vintage showed very well, both from France and California. And as I’ve found at other wine events in the past few years, California producers are stepping up the quality of their Rosés. The only real disappointment to me was finding more overtly oaky wines (particularly from California) at the 2012 tasting compared with those I recall from the previous year’s event and other recent tastings. That may have been at least in part a factor of the particular wines I tasted – and perhaps the youth of the wines – but it was something I did not anticipate. Still, there were plenty of outstanding wines to be found. The list of “Favorites” again includes some of the standout library wines that were poured in addition to current and soon-to-be-released bottled wines from the two main afternoon tastings as well as from the morning seminars. Overall I thought that the event ran remarkably smoothly in 2012, probably more so than I’ve seen for awhile – great job by the entire HdR staff and volunteers! The seminars were informative and fun, and as mentioned earlier, I felt the food at the event took a step up from the past couple of years. And as always, there were lots of outstanding wines at the afternoon tastings. Overall, this was a highly enjoyable 20th annual HdR. 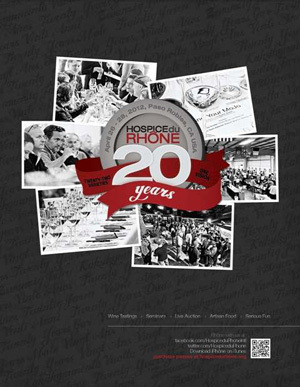 Hospice du Rhône has been my favorite annual wine event for many years – this was my 13th consecutive trip there. Sadly for many of us, the 2012 HdR event was the last one to be held in the large, three-day format in Paso Robles. An announcement from HdR shortly afterwards revealed that they will discontinue this event and focus “on smaller, more intimate settings” in the future, along the lines of the events they have held at Blackberry Farm in Tennessee (the 2013 edition of the Blackberry Farm event is being held in early May). However these smaller events work out, it certainly seems an end to the familiar convergence of so many Rhône wine fans from far and wide. HdR has billed itself as a “celebration of Rhône variety wines,“ and it was that true celebratory nature that made it so different and special for 20 years. We’ll look to the future of HdR, in whatever form it takes, but the memories of all those amazing gatherings in Paso Robles will always remain. Ampelos 2011 Rosé of Syrah, “Upsilon,” Santa Ynez Valley. 80% Syrah, 10% Riesling, 10% Grenache, sourced from four vineyards. Whole-cluster pressed, made entirely in stainless steel with no malolactic fermentation. Very light pink, displaying fresh strawberry aromas along with floral and spice notes. Bright mouthfeel and a crisp finish, nice. Ampelos 2008 Syrah, “Gamma,” Ampelos Vineyard, Sta. Rita Hills. 100% Syrah, from 99, 383, 470 and Estrella clones. Dark color, this showed ripe dark berry fruits, an herbal note, lots of spice and vanilla/oak undertones. Lively acidity with big but not aggressive tannins. Ampelos 2007 Grenache, “Delta,” Ampelos Vineyard, Sta. Rita Hills. 100% Grenache, aged for 33 months in 50% new oak and 50% neutral oak. Medium color with red fruits, spice, earth, pepper, and vanilla/oak on the nose. Big and structured with a very grippy tannic finish. Comments: The Ampelos estate vineyard is biodynamically-farmed. Argot 2011 Rosé, “Couture,” Mendocino County. 100% Grenache, neutral oak. Light pink color, this displayed shy watermelon aromas, with moderate acidity and a fairly smooth finish. Argot 2010, “The Articulator,” Sonoma County. 60% Roussanne, 40% Chardonnay, 100% malolactic, 50% new oak. Light color, with ripe stone fruit and pear aromas plus a spice note. Rich and full-bodied, with a smooth finish. Argot 2008 Syrah, “The Opening Salvo,” Bennett Valley. 100% Syrah, aged 30 months in 100% new oak. Dark color, featuring ripe dark berry fruit, chocolate, spice, and vanilla/oak. Rich and lush on the palate, with moderate tannins. Argot 2009 Syrah, “The Distance,” Bennett Valley. 93% Syrah, 7% Roussanne, aged 50% new oak. Dark color, blackberry, pepper, and less spice and oak than the previous wine. Livelier mouthfeel with medium-big tannins. Argot 2010 Red Wine, Bennett Valley (barrel sample). 33% Grenache, 67% Syrah. Medium-dark color, showing both red and black fruits, earth, and spice. Good acidity in the mouth with a big, tannic finish. Argot 2011 Syrah, Bennett Valley (barrel sample). 100% Syrah. Dark color, with blackberry, earth, pepper, and spice. Big and structured with chewy tannins. Comments: The 2009 Syrah had not yet been released at the time of the tasting. Winemaker Justin Harmon said that the 2011 Syrah features a larger percentage of estate fruit and more Alban clone Syrah fruit than earlier vintages. Baiocchi 2011 Rosé, “Neophyte,” Baiocchi Family Vineyards, Fair Play. From 70% Grenache, 30% Mourvèdre. Light salmon/pink color, with aromas of strawberry, orange rind, and spice. Medium-light bodied with a fairly smooth mouthfeel and finish. Baiocchi 2009 Grenache, “Entre Nous,” Baiocchi Family Vineyards, Fair Play. 90% Grenache, 10% Syrah. Medium color, featuring ripe red fruits, dried herbs, and spice/oak on the nose. Medium-bodied with moderate acidity and milder tannins. Baiocchi 2009 Syrah, “Sprezzatura,” Baiocchi Family Vineyards, Fair Play. 90% Syrah, 10% Grenache. Dark color, this showed ripe black fruits, spice, and minerals. Lively texture on the palate with a big, chewy tannic finish. Comments: 2009 marked the first release for Baiocchi. Grenache, Syrah, Mourvèdre, and Tempranillo were planted at their Sierra Foothills vineyard in 2006. Greg Baiocchi had previously worked with Bradley Brown of Big Basin. Comments: These wines were poured at the Friday morning “Why Spain (still) Rocks” seminar, and were stunning. 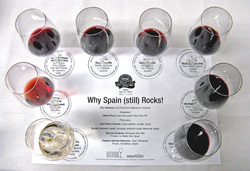 Comments: These wines were poured at the Friday morning “Why Spain (still) Rocks” seminar. Cabot 2002 Syrah, Old Mill Vineyard, Humboldt County. Medium color, with meaty and savory aromas together with plummy fruit. Medium-bodied with resolved tannins, seems ready to drink now. Cabot 2007 Syrah, Humboldt County. About 20% whole-cluster fermentation and a little Viognier. Dark color with black pepper, smoked meat, and minerals. Lively and structured, this deserves further development in the cellar. Cabot 2008 Syrah, Humboldt County. Dark color, this showed a more plummy fruit profile along with spice and campfire smoke on the nose. Big and very grippy on the finish, where the smoky component returned. Cabot 2009 Syrah, Humboldt County. Dark color, the nose was quite shy but displayed dark berries and a stony mineral quality. Very big structure and quite tannic on the finish, this will need years to show its best. Cabot 2009 Syrah, “Kimberly’s,” Humboldt County. 6% Viognier. Dark color, with more open aromatics of black fruits, flowers, minerals, grilled meat, and black pepper. Another big, structured wine with a chewy tannic finish, but showing more in its youth than the previous wine and with fine potential as well, nice. Cabot 2007 Syrah, “Kimberly’s,” Humboldt County. 6% Viognier. Dark color, this featured a riper fruit profile than the 2009, along with smoky bacon and pepper notes. Big mouthfeel and very grippy tannins on the finish. Cabot 2010 Pinot Noir, Nash Mill Vineyard, Anderson Valley. 75% Pommard 4 clone, 25% 115 clone, 100% destemmed. Medium-light color, with earthy and spice red fruits on the nose. Lively on the palate and on the finish, nice wine but a rather jarring contrast coming after all the big Syrahs. Comments: The Cabot Syrahs were all quite structured and tannic, showing the need for more bottle age. Their Pinot was the only non-Rhône style wine I tasted at the event. Carica 2011 Rosé, Mendocino County. From Grenache and Syrah sourced from Eaglepoint Ranch. Medium-light pink, featuring bright strawberry and citrus aromas. Crisp acidity and a clean finish. Carica 2008 “The Siren,” Kick Ranch, Sonoma County. 70% Syrah, 15% Grenache, 15% Mourvèdre. Medium-dark color, with dark berry fruit, baking spices, chocolate, and vanilla/oak on the nose. Fairly rich texture with medium-big tannins on the finish. Carica 2008 Syrah, Kick Ranch, Sonoma County. Dark color, this displayed brighter black fruits, herbs, minerals, and black pepper. Lively on the palate with good structure, nice. Carica 2009 Syrah, Kick Ranch, Sonoma County. Dark color, showing riper blackberry and spice on the nose. Bigger and richer mouthfeel but with good acidity, and chewy tannins on the finish. Comments: The 2009 Kick Ranch Syrah had not yet been released at the time of the tasting. Cayuse 2009 Grenache, “God Only Knows,” Armada Vineyard, Walla Walla Valley. 90% Grenache – Christophe Baron says of the other 10%, “God only knows.” From a hot vintage, aged in neutral puncheons. Medium garnet color, ripe plum with stemmy/herbal overtones, earth, and minerals. Medium weight with moderate tannins on the finish. Cayuse 2008 Grenache, “God Only Knows,” Armada Vineyard, Walla Walla Valley. 90% Grenache, 10% “God only knows.” From a cooler vintage, aged in neutral puncheons. Slightly darker color than the 2009, with more intense aromatics of ripe red fruits, fresh herbs, black pepper, and baking spice. Medium-bodied with a fairly lively mouthfeel and grippier tannins on the finish, nice. Cayuse 2008 Syrah, Cailloux Vineyard, Walla Walla Valley. Co-fermented with around 6-10% Viognier. Medium-dark purple color, this featured bright floral aromas along with dark berry fruit, pepper, and lots of spice. Medium-rich texture with a lively finish and moderate tannins. Cayuse 2008 Syrah, En Cerise Vineyard, Walla Walla Valley. Dark color, displaying lots of black pepper on the nose, plus blackberry, exotic spices, and an iron/mineral note. Medium-full bodied, with more structure and a more firmly tannic finish. Cayuse 2008 Syrah, En Chamberlin Vineyard, Walla Walla Valley. Dark but more vibrant color, this had smoky, bacony scents, blackberry, stems/herbs, and earth. Richer mouthfeel than the first two Syrahs, with medium structure and a smoother finish. Cayuse 2008 Syrah, Armada Vineyard, Walla Walla Valley. Dark color, a bit more reddish and less purple, showing intense plum and black cherry fruit, black olives, and minerals on the nose. Big and structured on the palate, with a chewy tannic finish. Cayuse 2008 Syrah, “Bionic Frog,” Walla Walla Valley. This wine is typically around 30-50% whole-cluster fermentation. Dark purple color, slightly floral aromas plus plum, lots of baking spice, smoked meat, and a touch of pepper. Big and bold in the mouth, this finished with firm tannins. Cayuse 2007 Syrah, “Bionic Frog,” Walla Walla Valley. Dark color, featuring even more spice but less smoke than the 2008 version, along with a darker fruit profile and a briny, black olive note. This was brighter on the palate than the 2008, with a big, grippy finish. Cayuse 2006 Syrah, “Bionic Frog,” Walla Walla Valley. Very dark color, with more intense ripe black fruits, herbs, grilled meat, black pepper, earth, and a smoky, tarry element, very complex aromas. Rich but lively mouthfeel with big, yet refined tannins, nice. Comments: Cayuse vintner Christophe Baron presented his wines at the Friday morning “The Return of the Bionic Frog” seminar. From biodynamically-farmed vineyards, all of the wines are fermented with native yeast, and the Syrahs are aged in about 10-20% new oak. These wines were poured at the Friday morning “The Return of the Bionic Frog” seminar – see the separate linked report. Font du Loup 2011 Blanc, Châteauneuf-du-Pape. About 35% Grenache Blanc, 35% Roussanne, 15% Clairette, 15% Bourboulenc, made in stainless steel and some neutral oak. Light straw color, this featured apple and stone fruit plus lots of spice. Medium weight and lively on the palate, with a long tasty finish, nice. Font du Loup 2001 Châteauneuf-du-Pape. About 50% Grenache, 20% Syrah, 15% Mourvèdre, and 15% Cinsault. Medium-light color with some bricking, showing earthy red fruits, pepper, dried herbs, and spice. Medium-bodied with nicely-resolved tannins and ready to drink now. Font du Loup 2005 Châteauneuf-du-Pape. Same blend as 2001. Medium-light color, with brighter red berry fruit along with herbs and black pepper. Big and tannic, this is still in need of more time in the cellar. Font du Loup 2009 Châteauneuf-du-Pape. About 60% Grenache, plus Syrah, Mourvèdre, and Cinsault. Medium-light color, featuring red fruits, dried herbs, and baking spices. Juicy mouthfeel with fine acidity and fairly big tannins, nice. Le Puy Rolland 2007 “Vieilles Vignes,” Châteauneuf-du-Pape. 100% Grenache from 100 year-old vines. Medium-light color, this showed more earthy aromas along with bright strawberry and herb notes. Medium-bodied with a lively finish and medium tannins, nice. Font du Loup 2010 Châteauneuf-du-Pape. Medium-light color, displaying aromas of very fresh and pure strawberry and cherry, minerals, and herbs. Medium weight and lively on the palate, with fine tannins, quite pleasant for such a young CdP. Le Puy Rolland 2010 “Vieilles Vignes,” Châteauneuf-du-Pape. 100% Grenache from 100 year-old vines. Medium color, this showed more spice on the nose together with red berry fruit, earth, and a touch of pepper. Richer mouthfeel with moderate tannins on the finish. Comments: The 2009 Font du Loup and 2007 Le Puy Rolland were poured from magnum at the Paul M. Young Fine Wines table. Vintner Anne Charlotte Melia’s group of wines was one of the standouts of the event for me. Château Saint Nabor 2011 Blanc, “Tradition,” Côtes du Rhône. 80% Roussanne, 10% Grenache Blanc, 10% Ugni Blanc. Very light straw color, this featured bright and fresh apply and pear aromas and a touch of dried herbs. Crisp mouthfeel and a clean, pleasant finish, nice. Domaine Saint Nabor 2011 Viognier, Vin de Pays d’Oc. Light color, with ripe stone fruit and lees notes on the nose. Medium-bodied with a fairly smooth finish. Domaine Saint Nabor 2011 Rosé, “Gris de Nabor,” Vin de Pays du Gard. From Grenache, Tempranillo, and Cinsault, whole-cluster pressed. Very light salmon color, displaying citrus and watermelon fruit and spice. Medium-light weight on the palate with moderate acidity. Château Saint Nabor 2011 Rosé, “Tradition,” Côtes du Rhône. From mostly Grenache, plus Syrah, Carignan, Cinsault. Light salmon-pink color, more ripe red fruits along with fennel and other dried herbs. Bigger in body than the “Gris de Nabor” with a touch of tannin on the finish. Château Saint Nabor 2010 Rouge, “Tradition,” Côtes du Rhône. From mostly Grenache, plus Syrah, Carignan, Cinsault. Medium-light color, spicy red fruits, and herbs on the nose. Medium-light bodied and lively with moderate tannins and a pleasant finish. Domaine des Santonilles 2009 Côtes du Rhône Villages. Grenache, Syrah, Mourvèdre, Carignan. Medium-light color, this was less fruit-forward and more complex than the “Tradition” bottling, with earthy and savory notes followed by plum and black cherry fruit. Medium-boded and bright on the palate with moderate tannins. Château Saint Nabor 2009, “Cuvée Prestige,” Côtes du Rhône Villages. Grenache, Syrah, Mourvèdre, Carignan. Medium-light color, with more depth to the fruit and more spice character than the other two reds. Bigger, rounder mouthfeel with more structure and tannin on the finish. Comments: There is no oak or malolactic fermentation on the whites, and no oak on most of the reds except neutral oak for the “Cuvée Prestige.” The 2009 Domaine des Santonilles was my favorite of the reds. Trinquevedel 2011 Rosé, Tavel. Medium-light salmon/copper color, showing spice, red fruits, and earth aromas. On the bigger and richer style for Tavel, with a touch of heat on the finish. Comments: This wine was poured at the Syndicat Tavel Wines table. Clos Saint Jean 2009 “Sanctus Sanctorum,” Châteauneuf-du-Pape. 100% Grenache from 100 year-old vines. Medium color, with ripe red fruits, along with touches of flowers and spice. Fairly big and bold in the mouth, with grippy tannins on the finish. Clos Saint Jean 2009 “La Combe des Fous,” Châteauneuf-du-Pape. About 60% old-vine Grenache, 20% Syrah, 10% Cinsault, 10% Vaccarèse. Medium color, with brighter red and black fruit aromas along with more peppery, earthy, and savory notes and less of a spice component. Lively texture on the palate with tannins that were firm but not aggressive, and a long finish, very nice. Clos Saint Jean 2009 “Deus ex Machina,” Châteauneuf-du-Pape. 60% old-vine Grenache and 40% Mourvèdre. Medium color, with a more plummy fruit profile along with earth, herbs, and baking spices. Bigger mouthfeel with grippy tannins. Comments: These wines were poured from magnum poured at the Paul M. Young Fine Wines table. All three wines feature Grenache from 100+ year-old vines. The “Sanctus Sanctorum” is ultra-rare, with the sole production of this wine being a few hundred magnums. I thought the 2009 “La Combe des Fous” was one of the standout wines of the entire event. Comments: This wine was poured at the Friday morning “Why Spain (still) Rocks” seminar. Comments: These wines were poured at the Saturday morning “d’Arenberg” seminar. Demetria 2009 “Cuvée Constantine,” Santa Ynez Valley. 67% Grenache, 24% Mourvèdre, 9% Syrah. Medium-dark color, lots of spice on the nose along with plum and earth. Medium-bodied with lively acidity and a firmly tannic finish. Demetria 2009 “North Slope,” Santa Ynez Valley. 95% Syrah (mostly Hermitage clone, plus 99 and 877), 5% Viognier, aged in larger cooperage. Dark color, with black fruits with a floral lift, baking spice, and vanilla/oak. Richer mouthfeel with a grippy finish. Berthète 2010 “Sensation,” Côtes du Rhône. 80% Grenache Blanc, 20% Bourboulenc. Light color, with rather shy aromas of tangerine and earth. Medium-light weight in the mouth, fairly simple. Comments: This wine was poured at the Rhône Valley Wines table. Mordorée 2011 Rosé, Tavel. Very light pink color, displaying earthy and spicy red fruits along with a touch of dried herbs. Medium-light bodied with a crisp finish, nice. Mourchon 2009 “Grand Réserve,” Côtes du Rhône Villages Seguret. 65% Grenache, 25% Syrah, 10% Carignan. Medium color, bright aromas of black cherry, plum, earth, and herbs. Lively mouthfeel with moderate tannins on the finish. Durand 2009 “Lautaret,” Saint-Joseph. Medium-dark color, this featured bright plum and blueberry fruit, earth, and black pepper. Lively acidity on the palate with moderate tannins, nice. Durand 2009 “Confidence,” Cornas. From older vines. Medium-dark purple, with gamey, meaty aromas along with darker berry fruit, dried herbs, and a touch of pepper. More structured than the Saint-Joseph, with chewy tannins that will need time to mellow out, this wine has lots of promise, nice. Comments: These wines were poured at the Paul M. Young Fine Wines table, and both were quite impressive. Villard 2010 “De Poncins,” Condrieu. Light straw color, this showed fresh stone fruit aromas along with a mineral note. Juicy acidity in the mouth and a crisp, clean finish, nice. Villard 2010 “Le Grand Vallon,” Condrieu. Light color, with riper stone fruit and tropical fruit, plus a touch of sweet oak. Medium-rich mouthfeel with a fairly smooth finish. Villard 2008 “Reflet,” Saint-Joseph. Medium-dark color, with ripe plum, pepper, and spice on the nose. Bright and lively on the palate, with firm but refined tannins. Villard 2009 “Le Gallet Blanc,” Côte-Rôtie. Medium-dark color, this was less fruit-forward, displaying meaty and earthy aromas plus black pepper and dark fruits. Big and structured, finishing with grippy tannins that will need cellar time to smooth out – a young wine with very good potential. Comments: François Villard once again presented a fine group of wines, and his “De Poncins” Condrieu was a particular highlight. Comments: These wines were poured at the Robert Kacher Selections table. Jean Royer 2007 “Cuvée Hommage à Mon Père,” Châteauneuf-du-Pape. 100% Grenache from 115+ year-old vines. Medium color, displaying red fruits, minerals, grilled meat, and spice on the nose. Medium weight on the palate, with moderate tannins. Barroche 2009 “Signature,” Châteauneuf-du-Pape. 66% Grenache, 15% Syrah, 13% Mourvèdre, 6% Cinsault. Medium-dark color, ripe black cherry and plum fruit plus dried herbs, baking spice, and an overlay of sweet oak. Lively mouthfeel with grippy tannins on the finish. Barroche 2009 “Pure,” Châteauneuf-du-Pape. Entirely from 100-year old Grenache from a single plot, near Rayas. Medium color, showing brighter red fruits and less oak than the “Signature” bottling, plus more pepper, earth, and mineral aromas. Big but vibrant on the palate, with a firm tannic structure – showing nicely now and has the potential to develop beautifully. Comments: Vintner Julien Barrot poured the Barroche wines. The “Pure” bottling was among my favorite 2009s from Châteauneuf-du-Pape. Le Colombier 2010 “Vieilles Vignes,” Vacqueyras. About 80% Grenache, 20% Mourvèdre. Medium color, this showed red fruits, pepper, and dried herbs on the nose, along with a slight minerally note. Juicy mouthfeel, with a firmly tannic finish, nice. Maby 2011 Rosé, “Prima Donna,” Tavel. Light pink color, showing bright strawberry fruit, minerals, and herbs on the nose. Lighter-bodied and lively with a fresh, pleasant finish. Perhaps a bit on the simple side but this should be quite an enjoyable summertime wine. Gangloff 2010 Condrieu. Light straw color, with bright aromas of ripe pear and stone fruit, honey, and flowers. Fairly rich but lively in texture, with a long finish. A bolder-style Condrieu but well-balanced, quite nice. Gangloff 2009 “La Barbarine,” Côte Rôtie. Medium-dark color, bright floral aromas along with bacon fat, spice, plum and blueberry, and minerals. Bold and rich on the palate with a fairly big tannic finish, nice. Gangloff 2010 “La Barbarine,” Côte Rôtie. Medium-dark color, featuring minerally black fruits, along with iron, spice, and floral notes. Medium-rich with youthful tannins, nice. Gangloff 2010 “La Sereine Noir,” Côte Rôtie. From 50 year-old vines. Medium-dark color, this had riper fruit along with pepper, meat, and mineral notes. Lively mouthfeel and finish with grippy tannins. Comments: Yves Gangloff’s appearance at this year’s event was a surprise, as he was not listed in the Event Guide. He poured at the Yves Cuilleron table on Friday, and displayed an outstanding group of 2010 wines. The 2009 “La Barbarine” was poured on Saturday at the Paul M. Young Fine Wines table. Moulin la Viguerie 2011 Rosé, “Les Falaises de Braise,” Tavel. Medium-light pink color, with fairly earthy aromas and less brightness to the red fruit character. Medium weight and fairly round in the mouth with a smooth finish. Rouvre Saint Leger 2010 Blanc, Côtes du Rhône Villages-Laudun. 100% Viognier. Light color, with aromas of stone fruit and tropical fruit. Fairly rich texture with a smooth finish. Saladin 2009 “Paul,” Côtes du Rhône. 90% Grenache, 10% Clairette. Medium-light color, this had earthy black cherry fruit with lots of spice on the nose. Medium weight on the palate with a chewy tannic finish. Cuilleron 2009 “Vertige,” Condrieu. Medium-light straw color, with ripe stone fruit along with spice and oak notes. Fairly rich mouthfeel with a smooth finish. Cuilleron 2009 “Terres Sombres,” Côte-Rôtie. 100% Syrah. Dark color, displaying smoky bacon, earth, plum and darker berry fruit, and pretty floral aromas. Fairly big but lively on the palate with moderate tannins, nice. Cuilleron 2009 “Les Serines,” Saint-Joseph. Dark color, with more upfront black fruit, minerals, and a savory character. Big and a bit rough at this youthful stage, with grippy finishing tannins. Comments: The 2009 “Terres Sombres” was especially impressive. Pierre Gaillard 2010 “L’Octroi,” Condrieu. Medium-light straw color, with minerally bright stone fruit aromas. Medium weight in the mouth with juicy acidity and a lively finish, nice. Domaine Madeloc 2005 “Cuvée Magenca,” Collioure. Blend of Grenache, Mourvèdre, Syrah, and Carignan. Medium-dark color, featuring savory, herbal red fruits and earth. Medium-bodied with a firm tannic finish. Comments: Pierre Gaillard poured one of my favorite Condrieus of the tasting. Dragonette 2011 Rosé, Santa Ynez Valley. Mostly Grenache along with some Mourvèdre and Syrah. Very light pink color, featuring fresh strawberry aromas with some earth and mineral notes. Vibrant mouthfeel with a crisp, clean finish, nice. Dragonette 2010 “Grenache-Mourvèdre-Syrah,” Santa Barbara County. Medium color, bright strawberry, dried herb, and spicy oak on the nose. Medium weight in the mouth with milder tannins. Dragonette 2009 “Seven,” Central Coast. 94% Syrah, 4% Grenache, 2% Mourvèdre. Dark color, this showed black fruits, spice, earth, and vanilla/oak. Big and rich on the palate, with firm tannins. Dragonette 2009 “MJM,” Central Coast (barrel sample). Syrah sourced from Stolpman, Shadow Canyon, Los Tres Burros, and Harrison Clarke vineyards. Ripe dark berry fruit, spice, and a touch of mocha. A full-bodied texture, with grippy, youthful tannins. Comments: These wines were poured at the Vintus table. Halcón 2011 “Prado,” Alder Springs Vineyard, Mendocino (barrel sample). 45% Marsanne, 45% Roussanne, 10% Viognier. Light straw color, displaying stone fruit, spice, and honey on the nose. Fairly rich and smooth in the mouth, with a pleasant finish. Halcón 2010 Mourvèdre, “Esquisto,” Halcón Vineyard, Yorkville Highlands. A little Syrah blended in. Medium-dark color, with earthy plum and blueberry fruit, spice, and a touch of oak. Medium-bodied with a moderately tannic finish. Halcón 2011 “Esquisto,” Halcón Vineyard, Yorkville Highlands (barrel sample). 40% Grenache, 30% Mourvèdre, 30% Syrah. Medium-dark color, this had brighter aromatics, with red fruits, spice, and dried herbs. Livelier acidity in the mouth with bigger tannins, very young at this stage but has the potential to be quite good. Halcón 2009 Syrah, “Alturas,” Halcón Vineyard, Yorkville Highlands. About 30% new oak. Dark color, with minerally and peppery black fruits and earth. Fairly big and structured, this finished with grippy tannins. Halcón 2010 Syrah, “Alturas,” Halcón Vineyard, Yorkville Highlands. About 30% new oak, bottled a week earlier. Dark color, with a similar aromatic profile to the 2009 but showing more primary fruit, more pepper, and more oak at this point. Bright acidity and very big tannins that need time to calm down. Halcón 2011 Syrah, “Alturas,” Halcón Vineyard, Yorkville Highlands (barrel sample). About 20% new oak. Dark color, not surprisingly this had even more of an upfront blackberry fruit profile but also showed herbs and black pepper. Another big, structured wine with plenty of grip. Comments: Grower Paul Gordon was behind the table. The vineyard is farmed organically, and no adjustments are made to the wines. The 2009 was the first vintage of the estate “Alturas” Syrah. Hug 1994 Syrah, Edna Valley. Medium color, with funky, leathery aromas up front, followed by plum and blueberry fruit and spice. Medium-bodied and fairly smooth in the mouth, this still showed moderately firm tannins on the finish. Hug 2009 “el Papé,” Central Coast. 70% Grenache, 25% Mourvèdre, 5% Syrah, sourced from Cedar Lane and Santa Barbara Highlands vineyards. Medium-dark color, this displayed ripe red fruits, spice, and earth on the nose. Medium-bodied and lively on the palate, with moderate tannins. Hug 2009 “el Maestro,” Central Coast. 80% Grenache, 10% Mourvèdre, 10% Syrah, sourced from Cedar Lane and Santa Barbara Highlands vineyards. Medium color, showing bright cherry and strawberry, spice, and minerals. Medium-bodied with good acidity and more noticeable tannins on the finish. Hug 2010 “el Forastero,” Central Coast. 100% Mourvèdre sourced from La Vista Vineyard in Paso Robles and from Santa Barbara Highlands Vineyard. Medium purple color, plum and lots of baking spice aromas along with dried herbs and a touch of sweet oak. Bigger mouthfeel with firm tannins. Hug 2009 “el Jefe,” Central Coast. 41% Grenache, 28% Mourvèdre, 31% Syrah. Medium-dark color, featuring ripe black cherry and plum, herbs, earth, and vanilla/oak. More full-bodied and structured, with a grippy tannic finish. Hug 2010 “el Chico,” Central Coast. 100% Syrah sourced from La Vista Vineyard and Estrella Farms in Paso Robles and from Cedar Lane Vineyard. Dark color, with blackberry, spice, chocolate, and oak on the nose. Rich and viscous, with a long finish and medium-big tannins. Jaffurs 2010 Grenache Blanc, Thompson Vineyard, Santa Barbara County. Fermented in about 50% each stainless steel and neutral oak, aged in neutral oak. Very light straw color, this featured ripe stone fruit and fig aromas with a touch of herbs. Medium-light bodied with a smooth mouthfeel and finish. Jaffurs 2010 Viognier, Santa Barbara County. Sourced mostly from Bien Nacido and Refugio Ranch vineyards, made entirely in neutral oak. Light color, tropical fruit with floral and lees notes. Richer on the palate than the Grenache Blanc with a fuller finish. Jaffurs 2009 Grenache, Santa Barbara County. 100% Grenache, sourced from 77% Thompson and 23% Larner vineyards, with the Larner fruit fermented whole-cluster. Light garnet color, showing red fruits and loads of spice on the nose. Medium-bodied with moderate acidity and tannins. Jaffurs 2010 Syrah, Santa Barbara County. 95% Syrah, 3% Petite Sirah, 2% Viognier, sourced from six vineyards. Medium-dark color, very aromatic with pretty floral character as well as dark berries and black pepper. Medium weight on the palate with moderate tannins, this should be ideal for drinking in the next few years. Jaffurs 2009 Syrah, Larner Vineyard, Santa Ynez Valley. Dark color, the earthy component of this wine came to the fore, with plum, leather, and spice notes following. More full-bodied, with grippier tannins on the finish. Jaffurs 2009 Syrah, Bien Nacido Vineyard, Santa Maria Valley. Dark color, displaying upfront blackberry fruit along with spice, dried herbs, and a touch of pepper. Less dense on the palate than the Larner bottling but with more substantial tannins. Jaffurs 2010 Petite Sirah, Thompson Vineyard, Santa Barbara County. Very dark color, with earthy and slightly floral dark fruits, spice, and vanilla/oak aromas. Quite rich mouthfeel with a big tannic finish. Comments: Though the 2009 single-vineyard Syrahs may outshine it in time, right now the 2010 Santa Barbara County bottling is showing very well. Kaena 2009 Grenache, Santa Ynez Valley. About 5% each Mourvèdre and Syrah, sourced mostly from Tierra Alta Vineyard along with Larner Vineyard. Medium-light color, this featured lightly floral scents plus ripe red fruits and spice. Medium-bodied and fairly lively with moderate tannins. Kaena 2009 Grenache, Tierra Alta Vineyard, Santa Ynez Valley. 33% whole-cluster fermentation. Medium-light color, with brighter fruit aromas along with floral notes and plenty of spice. More structured on the palate with bigger tannins. Kaena 2009 Grenache, Larner Vineyard, Santa Ynez Valley. 100% destemmed. Medium color, showing a darker fruit profile, spice, earth, and undertones of oak. Fuller-bodied than the other two Grenache bottlings, this had medium tannins. Kaena 2009 “Hapa,” Santa Ynez Valley. 60% Syrah, 30% Grenache, 10% Mourvèdre. Medium-dark color, displaying more herbal aromas, dark berry fruit, lots of spice, and vanilla/oak. Medium-bodied with moderately grippy tannins. Kaena 2011 Grenache Rosé, Santa Ynez Valley. Light pink color, bright and fresh strawberry on the nose plus dried herbs. Crisp acidity with a clean, tasty finish, nice. Kaena 2010 “Hapa Blanc,” Santa Ynez Valley. 85% Grenache Blanc, 15% Roussanne. Light color, this had apple and pear, spice, and a touch of earth on the nose. Medium-bodied with a fairly smooth mouthfeel and finish. Kaena 2010 Grenache Blanc, Santa Ynez Valley. Sourced from Estelle Vineyard near Los Olivos. Light straw color, with more pure ripe stone fruit aromatics along with a minerally note. Medium-bodied with a livelier texture and finish than the “Hapa Blanc” bottling. Comments: Winemaker Mikael Sigouin was behind the table, and poured the Rosé and whites after the reds. Kale 2009 Syrah, “Spirit Rock,” Alder Springs Vineyard, Mendocino County. About 20% whole-cluster fermentation and 10% Viognier, aged 18 months in 33% new French oak. Medium-dark color, with pretty floral aromas followed by dark berry fruit, black pepper, and minerals. Medium-full bodied with good acidity and structure for aging, nice. Kale 2009 “Home Run Cuvée,” Kick Ranch Vineyard, Sonoma County. 68% Syrah, 27% Grenache, 5% Viognier, aged 18 months in 25% new French oak. Medium color, this showed a ripe red fruit profile along with more spice, earth, and dried herbs on the nose. Medium-bodied and lively on the palate, with firmer tannins on the finish than the “Spirit Rock,” another promising young wine that deserves a few years of bottle age. Comments: Kale was a new producer to me, and winemaker Kale Anderson (he is also the winemaker at Napa’s Cliff Lede) poured a couple of impressive wines. Katin 2009 Grenache Blanc, Paso Robles. 50% whole-cluster pressed, 50% pressed after 24-36 hour skin contact. Light straw color, featuring somewhat tart apple and pear, with touches of spice and petrol on the nose. Medium acidity but with a lively finish. Katin 2009 Viognier, Paso Robles. Made in neutral oak. Light straw color, this showed ripe tropical fruit and spice. Medium-rich mouthfeel and a fairly smooth finish. Katin 2008 Syrah, Michaud Vineyard, Chalone. 30% new oak. Medium color, with aromas of herbs, dark fruit, pepper, and lots of spice. Medium-bodied with a firm tannic structure. Katin 2008 Syrah, Glenrose Vineyard, Paso Robles. 33% new oak. Dark color, displaying black fruits, grilled meat, spice, and a touch of sweet oak. Bigger mouthfeel with moderate tannins. Katin 2008 Syrah / Viognier, Paso Robles. 90% Syrah, 10% added Viognier lees. Medium-dark color, bright floral aromas along with ripe dark fruits. A bit lighter on the palate and fairly lively, with a grippy tannic finish, quite distinctive. Keplinger 2007 “Red Slope,” Knights Valley. 90% Grenache, 10% Syrah. Medium-dark color, ripe red fruits, earth, lots of spice, and vanilla/oak. Medium-bodied with big tannins on the finish. Keplinger 2007 “Kingpin Rows,” Knights Valley. 100% Syrah. Dark color, this showed ripe dark berry fruit, baking spice, licorice, and pepper. Rich mouthfeel with a very grippy tannic structure. Keplinger 2009 “Red Slope,” Knights Valley. 96% Grenache, 4% Syrah, aged 18 months in 20% new French oak. Medium color, with fresh strawberry, earth, dried herbs, and minerals on the nose. Medium-bodied and lively on the palate, this finished with tannins that were firm but not aggressive, nice. Comments: Winemaker Helen Keplinger poured her wines sourced from Knights Valley in Sonoma County. The 2009 “Red Slope” was my favorite, young but quite promising. Comments: These wines were poured at the Saturday morning “A Collective Quest” seminar, and made by Yves Cuilleron, Pierre Gaillard, and François Villard. Louis Bernard 2009 Gigondas. Medium color, with ripe cherry and plum fruit, spice, and a touch of earth. Medium-rich on the palate with grippy tannins. Paul Lato 2010 Grenache, “Lumiere,” Larner Vineyard, Santa Ynez Valley. 100% destemmed, 50% new oak. Medium color, with red fruits and lots of spice and vanilla/oak. Medium-bodied with a moderately tannic finish. Paul Lato 2010 Syrah, “Il Padrino,” Bien Nacido Vineyard, Santa Maria Valley. The fruit from each side of the vines was picked ten days apart. Medium-dark color, displaying dark fruit, chocolate, spice, and pepper. Medium-rich texture with a lively finish and fairly big tannins. Comments: The Grenache bottling is Paul Lato’s first. Qupé 2004 Roussanne, Bien Nacido Hillside Estate, Santa Maria Valley. Medium-light yellow color, with aromas of stone fruit and honey with some leesy and nutty notes. Medium-rich texture with plenty of acidity, this had a long finish. This should develop beautifully for years to come. Qupé 1989 “Los Olivos Cuvée,” Santa Barbara County. 60% Syrah, 40% Mourvèdre. Medium color, with some initial funk and leather on the nose, followed by meat, herbs, earth, and plummy fruit. Still showing lively acidity, this has aged quite well. It’s hard to say whether this will get any better but it’s a very nice place right now. Ethan 2001 Syrah, Rancho Arroyo Grande Vineyard, Arroyo Grande. Medium-dark color, with lots of upfront dark berry fruit along with baking spices. Fairly big and rich but with good acidity as well, this had moderate tannins. Qupé 2000 Syrah, Bien Nacido Hillside Estate, Santa Maria Valley. Medium-dark, showing lots of black pepper and herbs along with blackberry fruit. Plenty of acid and grippy tannins on the finish indicated that this still needs time to soften. Qupé 2004 Syrah, Bien Nacido Hillside Estate, Santa Maria Valley. Medium color, less fruit-forward, with earth and pepper predominating. Big but lively, with very grippy tannins on the finish. Qupé 1992 Syrah, Bien Nacido Vineyard, Santa Maria Valley. Medium reddish-purple, with plums, dried herbs, and pepper on the nose. Medium-bodied with nicely-resolved tannins, this may be nearing its peak. Comments: Bob and Ethan Lindquist were behind the table, and poured library wines from magnums and larger bottles on Friday afternoon. The Ethan Syrah was his very first release. As usual, these wines were among the best older vintages poured at the event. Vidal-Fleury 2010 Blanc, Côtes du Rhône. Includes 75% Viognier, 15% Grenache Blanc. Light straw color, with intense aromas of stone fruit, minerals, and a mild floral note. Medium-rich mouthfeel but with fresh acidity and a clean, tasty finish, nice. Vidal-Fleury 2008 Condrieu. Medium-light color, showing pear, earth, honey, and oak spice on the nose. Smooth texture with moderate acidity and medium finish. Comments: These wines were poured at the Rhône Valley Wines table. Wind Gap 2009 “Rana,” California. 91% Grenache, 9% Mourvèdre, 100% whole-cluster fermentation. Sourced from James Berry and Booker vineyards in Paso Robles and from Castelli Knight Ranch on the Sonoma Coast. Medium color, with fresh red strawberry and cherry fruit, herbs, and a touch of minerals. Very bright acidity on the palate, with a lively, moderately tannic finish. Wind Gap 2009 Syrah, Majik Vineyard, Sonoma Coast. 33% whole-cluster fermentation. Medium-dark color, this showed bright plum and darker berry fruit, black pepper, minerals, and spice on the nose. Medium-bodied with vibrant acidity, a clean mouthfeel, and refined tannins, nice. Wind Gap 2008 Syrah, Armagh Vineyard, Sonoma Coast. Darker color featuring brambly dark fruits, smoke, and pepper. Richer mouthfeel and bigger tannins on the smoky finish.